In Mississippi, We Always Have Our Hand Out. But It’s Usually To Give, Not Receive. - Mississippi Believe It! Home » Resources » Campaign » In Mississippi, We Always Have Our Hand Out. But It’s Usually To Give, Not Receive. 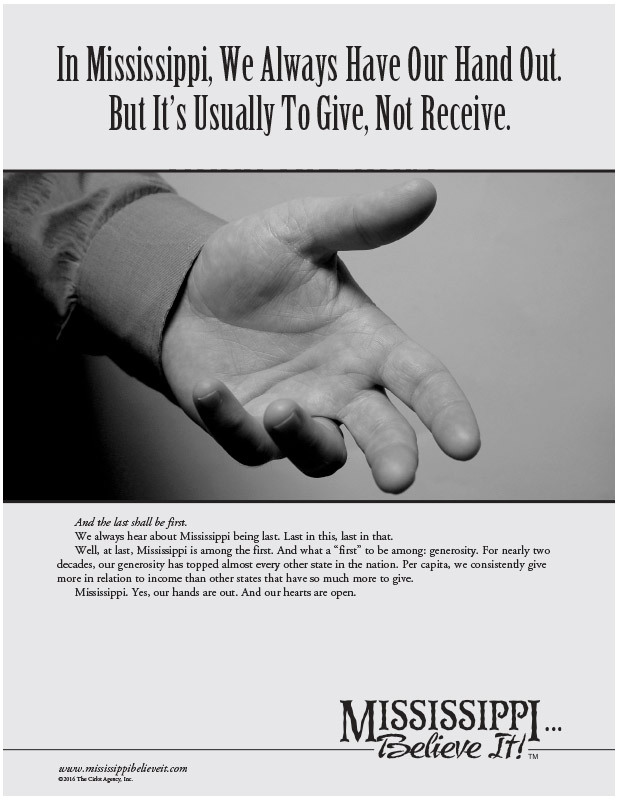 In Mississippi, We Always Have Our Hand Out. But It’s Usually To Give, Not Receive. And the last shall be first. We always hear about Mississippi being last. Last in this, last in that. Well, at last, Mississippi is among the first. And what a “first” to be among: generosity. For nearly two decades, our generosity has topped almost every other state in the nation. Per capita, we consistently give more in relation to income than other states that have so much more to give. Mississippi. Yes, our hands are out. And our hearts are open.